The more we know and the better trained our people are, the more you benefit. Our team stresses longevity, quality and expertise. We proudly display more than 100 certifications our technicians have earned. It demonstrates their commitment to be the best for COMMWORLD and our clients. Four members of the COMMWORLD Management Team have 114 combined years of service in the telecom industry – all with the same company... COMMWORLD of Kansas City. Our Technical team averages 19 years of industry experience per person. Would you rather have a really excellent telecom experience or just an experience? Curt's technical education began at the Technical Institute in Rosemount, Minnesota. He joined COMMWORLD in 1982 and has been instrumental in the installation of over 4,000 telecom systems. 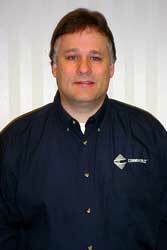 Curt's dedication to quality installations backed up by fast, efficient service set the benchmark for the COMMWORLD technical team and has earned him respect throughout the industry. He has earned certifications on countless technologies including Converged Technology Professional (CTP) - the industry standard certification for VoIP (Voice over Internet Protocol) technology. He is a Toshiba Converged Technology Expert (TCTE) - the highest level of VoIP certification awarded by Toshiba. He has achieved the Platinum Level Toshiba Sales Professional. In 2007, Curt was honored by Samsung Telecommunications America for achieving their highest level of Certification. Curt combines his tremendous technical experience and expertise with the ability to communicate effectively on a technical or non-technical level. With his leadership, the COMMWORLD team uses technology to solve customer's business challenges and help them become more productive and more profitable.